More than a hundred years ago, pioneers like Preston, Hollinger, McIntyre and the Timmins brothers, launched this Northern Ontario wilderness into the mining industry stratosphere making it one of the most well known gold producing regions in the world. Today, pioneers of a new millenium are again placing Timmins firmly in the spotlight and mining professionals from around the world are paying attention. The reason – a local mine with significant growth potential (Kirkland Lake Gold’s Taylor Mine) has taken delivery of its first zero-emission battery powered LHD – The Artisan A4. “The movement to zero-emissions, battery-powered equipment is a very positive development for the mining industry,” said Rick Rainville, Mine Manager at Taylor Mine. 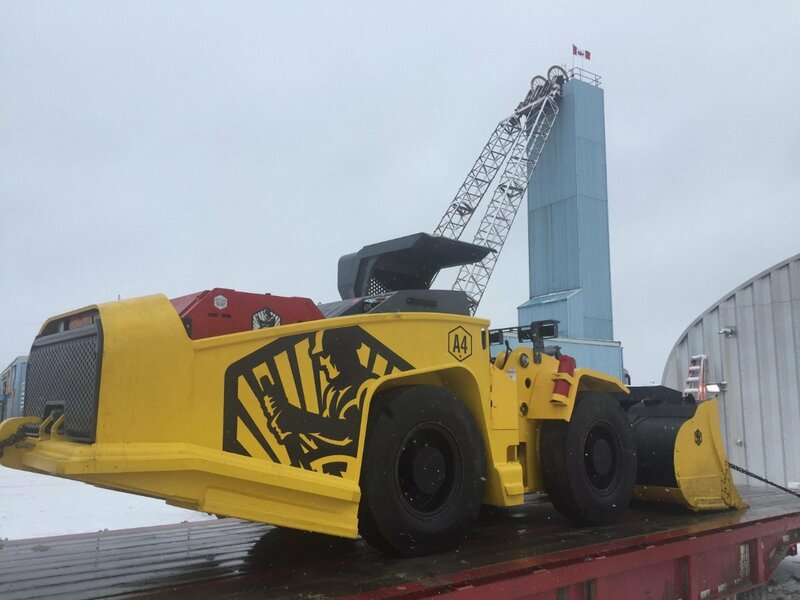 “We have seen the benefits of going to battery-powered loaders and trucks at our flagship Macassa Mine in Kirkland Lake, Ontario, and are pleased to be moving in that same direction at Taylor Mine,” he added. The Artisan A4 is a 4 tonne loader that has triple the power of a comparable diesel machine while producing only ⅛ of the heat. It’s a full meter shorter than its diesel rival offering superior agility and far greater visibility than any machine it its class. Operators prefer the A4 for its powerful and productive mucking capability as well as its cool, quiet performance with no poisonous diesel fumes. Taylor’s first A4 is on site now. Artisan’s Special Forces team (specializing in new mine deployments) is on the ground to ensure swift commissioning and to train the operators, technicians and management at Taylor. 2018 will be an exciting year for Taylor’s talented team and for the entire Timmins region. 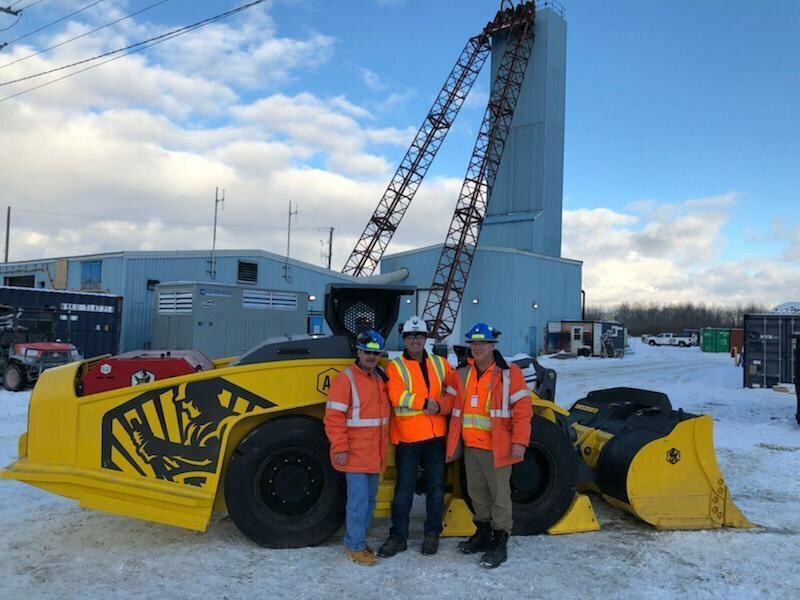 Mike Mayhew (center) proudly presents to Mine Manager – Rick Rainville (left) and General Manager – Duncan King (right) the first battery powered loader for Taylor mine in the Timmins mining region. Artisan Vehicles is an original equipment manufacturer (OEM) of zero emission battery powered mining vehicles. Artisan’s underground mining loaders and haul trucks are designed from the ground up to include the best thinking in vehicle engineering and to maximize the performance of its high powered, highly reliable, field proven battery electric powertrains. Artisan is headquartered in California, the heart of electric vehicle technology, and has recently opened a new service center in Kirkland Lake, Ontario, Canada. This new Canadian location will soon grow into an expansive Center of Excellence including a vehicle assembly plant, parts and service distribution center, and a technology education program for our customers and other mining industry professionals.